Outside temperatures might well be artic – Paris is in the midst of a blizzard this morning – but Karl Lagerfeld transported attendees of this season’s Chanel haute couture show to warmer climes. 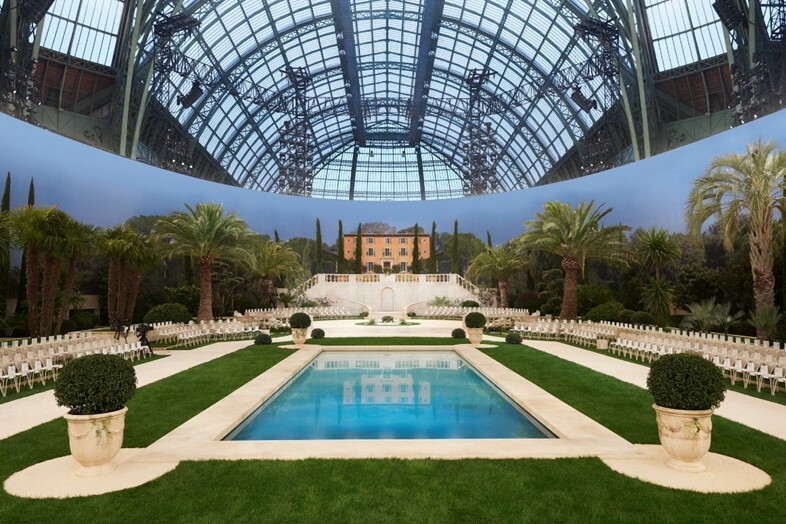 Namely, the gardens of a Mediterranean villa (Villa Chanel, as it was called on the invite) complete with perfectly manicured lawns, palm trees and a swimming pool, which had been constructed in the vast hall of the Grand Palais in typically grand style. Models descended the steps of the villa and looped the garden in front of guests, who watched on from white lawn chairs. For spring, Lagerfeld returned to his beloved 18th century, recalling the era’s silhouettes with décolletage-bearing suiting, in the house’s tweed, and gowns which nipped the waist and found volume in bubble hemlines and puff sleeves. Rococo excess was evoked through liberal use of feathers – plumes entirely covered above-the-knee skirts, jackets and trousers – while intricate floral embroidery, flamenco ruffles and broderie anglaise lent a sense of romance. The look was completed with Madame de Pompadour-esque bouffants, courtesy of Sam McKnight, who said via Instagram that the high-rise look had also been inspired by David Bowie’s Blitz Kids. Various shades of pink – including Kaia Gerber’s catwalk turn in an ornate, floral-embroidered candy pink gown – set the tone for a pastel-heavy collection, which encompassed various soft shades of fuschia, aqua, and mint. Iridescent paillettes, and embellishment in silver and gold, added surface interest, while rich shades of navy prevented the look from becoming saccharine. The collection was punctuated by a series of looks in black – including Largerfeld’s proposal for this season’s LBD: a mini-dress in layer-upon-layer of black tulle, edged with sequins and crystals. Lucia Pica, Chanel’s global creative make-up and colour designer, created a riposte to the suggestion a woman should choose an eye or a lip when it comes to applying one’s make-up: here, eyes came heavy with smudged Bleu Nuit shadow, while lips were vivid scarlet red (the shade: Rouge Allure). Like McKnight’s Bowie-inspired hair, it evoked the New Romantics of the 1980s, and the decade’s stay-up-all-night party girls. Apropos the poolside setting, the Chanel bride – model Vittoria Ceretti – did away with tradition entirely, selecting swimwear for her nuptials. Naturally, this was not any swimsuit but a Chanel haute couture swimsuit: a silver, crystal-embedded bodysuit with matching stilletos and swimming hat, complete with a diaphanous organza veil-slash-train. In Lagerfeld’s absence (an announcement by Michel Gaubert said he would be unable to attend), Ceretti was joined by Virginie Viard, director of the creative studio of the house, for the final bow.